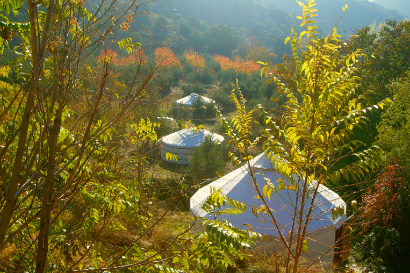 Tucked just below La Terraza de las Uvas is the first of our yurts. A round wood and canvas structure, La Casa Redonda is a large, high-roofed and open space. Rays of sunlight shine through the glass door and the reclaimed Andalucían windows, and down from the yurt’s hat in the middle of the canopy. The style of La Terraza is echoed here with star-shaped latticework and fabric of Andalucían-blue. Outside, La Casa Redonda has its own small terrace, surrounded by bamboo and fruit trees, and with a stone bench for catching the morning and evening sun. 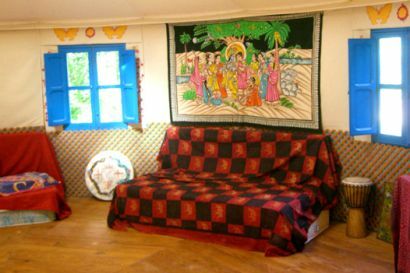 La Casa Redonda acts as the living room of our Yurt Centre, a welcoming space in which to relax with the rest of your group, whether they be family, new acquaintances, or friends of old. During the colder months you can cosy up together around the wood burner, fed with olive, cherry, walnut and oak logs from the Cortijo Vadillo farm. La Casa Redonda is also our group workshop space, with the smooth wooden floor making it perfect for movement and dance, yoga and tai chi. And its circular nature means that it is a great place in which to drum, sing, have talks and discussions, meditate, and dance.